The Salvatore family. Rosa Alioto, far right, was so frightened by rumors during early 1942 that, even though she was already a citizen, she studied and applied for citizenship again. Italian immigration to the West Coast, which began as early as the Gold Rush, reached full force around the turn of the century. By the 1930s the Italian population was at its peak: Italian Americans comprised the largest immigrant group not only in San Francisco, but in the entire United States. 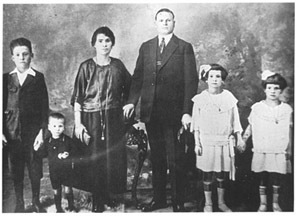 The thirties were not easy for these immigrants, either politically or economically. The Depression caused financial hardship for most. In addition, Italy under Mussolini was split between those who favored Il Duce's totalitarian policies, and those who opposed them. Fascists battled anti-fascists both under and above-ground. The battle crossed the ocean with the many anti-fascists who fled to exile in America. Italian communities like those in North Beach engaged in these disputes, not least in their newspapers. For the most part, however, the immigrant generation supported Mussolini. He seemed to have gained the world's respect for Italy by turning the old country into a disciplined modern nation. Much of the world press, including the major organs in the United States, portrayed him as a hero -- the first modern leader to lead his nation out of post-World War I chaos and Depression. Carmelo Ilacqua, onetime employee of the Italian Consulate in San Francisco, was interned at Missoula, Montana. His letters, with the censored parts cut out, are shown here. In 1935, with his invasion of Ethiopia, the portrait began to change. The League of Nations imposed economic sanctions on Italy. Many Italian Americans, following the lead of their Italian language press, saw this as a betrayal and continued to support the country where so many had relatives in service. Some donated to the Italian Red Cross, while thousands of others sent gold wedding rings and copper postcards to support the Italian war effort. When Italy allied with Germany and joined in the attack on France in 1940, however, the immigrants' worst fears were realized. Their Americans sons might soon have to make war on their Italian relatives. With the Japanese attack on Pearl Harbor in 1941 and the U.S. declaration of war on all three Axis powers, Italian Americans, and the formerly pro-fascist newspapers, hastened to affirm their loyalty to their adopted country. It made little difference. The measures to come made many immigrants feel that they were being blamed for where they had been born. Una Storia Segreta documents some of what happened in the days following Pearl Harbor: the internment of "dangerous" aliens beginning on the night of December 7; the re-registration of all enemy aliens and restrictions on their possessions and movements; the evacuation of thousands of aliens from "prohibited zones" on the West Coast; and the enforcement, again on the West Coast, of a stringent 8pm to 6am curfew. Failure to comply with any element could, and often did, lead to arrest and detention. This cartoon, from the May 28, 1942 San Francisco Chronicle, underlines the intention of General DeWitt to do to German and Italian Americans what he had already done to Japanese Americans. Subsequent months (February through June 1942) were a time of fear and confusion. 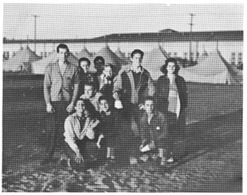 Rumors and newspaper articles reported that what all Californians were witnessing -- the mass internment of Japanese Americans, both citizens and aliens alike -- was being considered in some form for Italian and German Americans as well. Executive Order 9066 had made it possible to remove anyone, and General John DeWitt, the head of the Western Defense Command, seemed eager to use it. No one knew what might happen, or when. By June, political and economic considerations caused all such plans to be abandoned. In October 1942, Italians were formally removed from the enemy alien classification, and allowed to return to prohibited zones. The ordeal was not complete, however. Ironically, this was the very time that a few naturalized citizens whom the Tenney Committee found "dangerous" received exclusion orders: they were ordered to move from Military Zones 1 and 2, which covered the majority of California. Thus, even though most Italian aliens were no longer in the 'enemy alien' category, those interned in December 1941 and the newly excluded citizens remained in that category until the Fall of 1943, when Italy's fascist government surrendered. Despite the years of research that went into it, Una Storia Segreta makes no claim to be complete: some government documents are still classified, and requests for data under the Freedom of Information Act can wait years for a response. Still, we believe that what is known must be told now, primarily so that similar episodes might be prevented in the future. In addition, no one who has spoken to those affected can fail to be moved by the impact these measures had on them, their families, and their communities. Neither can one avoid the questions that arise. To what degree, for example, did the targeting of those whose first language was Italian hasten the disuse of the Italian language? Aside from much anecdotal evidence, no studies exist to provide figures. We do know, however, that many immigrants, clubs, and stores made a point of not using Italian in public, while others stopped teaching the language to their children. The U.S Government surely encouraged this trend by its poster proclaiming "DON'T SPEAK THE ENEMY'S LANGUAGE. SPEAK AMERICAN!" Much more might and surely will be said about these and other long-lasting effects. For now we think it appropriate to give the last words to Frances Cardinalli of Pittsburg, whose aging parents had to evacuate their home in Pittsburg and move to Centerville, near Fremont. Referring to a photo of her mother in her Sunday best, we asked if that was how her mother looked on the day she had to leave. "Oh God, no. It looked like a funeral. We were all dead. We couldn't part. We were never separated before." If immigration itself constitutes a little death, the the wartime for many Italian immigrants, and their communities, may come to be seen as yet another. 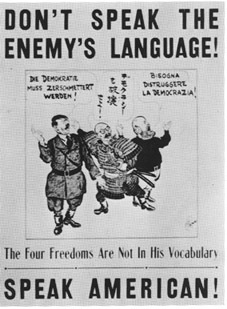 This wartime poster associated foreign language with disloyalty.